So, will this be called the Curve3? Why don’t they relax and stop reinventing the same device. There shouldn’t be any new device unless it improves the overall lineup. Stop with the new shells, but same engine. This isn’t a car which one expects yearly new models. RIM, please focus on making a great phone (then move on to the next great one). Refreshes of devices are nice, but only if you added something more than racing stripes. I get where you are coming from, but, put yourself in the shoes of someone buying a new phone. The Curve 8300 is the best selling BlackBerry ever, but, would you buy it, or, the 8500 which basically added a trackpad. The market demands new gear even if the changes from one model to the next are minimal. Enough already with the Memory comments. Robb Dunewood. I agree with you on the memory thing Robb. 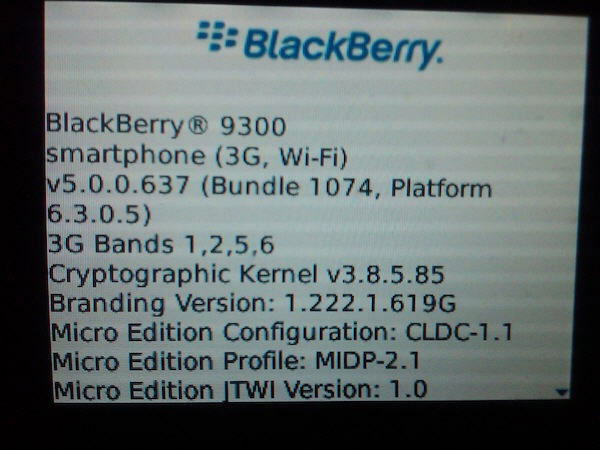 Ridiculous that RIM would launch a new device line in 2010 without the memory to run OS6. Apparently with its low res screen this is nothing but a 8520 with a GSM 3G radio and perhaps RIM thinks the screen would be too limiting to OS6 entirely. Then again, with the prices of RAM, why every BlackBerry designed in the past 2+ years hasn’t had a gig of RAM baffles me. Original Storm had a gig but RIM’s goofy partitioning made it useless.